This line of 57 Bongongo blood Angus weaned steers 6-7 months averaging 225kg from Braidwood, NSW returned 327c this week, purchased out of Hamilton, VIC. CATTLE numbers halved on AuctionsPlus this week, on the back of recent and forecast rain, to total 6727 head. Most young steer categories rose in price, while heifer category trends were mixed. Not surprisingly, the biggest drop in listing numbers was experienced in Queensland where ex- Cyclone Trevor continues to deliver widespread rain. With new-found confidence in the season moving forward and producers holding onto stock, listings from Queensland totalled 1427 head, a decrease of 6684 on the previous week. Clearance across all sales eased slightly to total 70 percent. Buyers were particularly active in Southern Queensland, purchasing 1338 head. Weaned steers boasted a 93pc clearance selling from 239c to 346c to average 298c, up 16c on last week. The top price in this category was returned by a line of 87 weaned Angus steers 5-8 months averaging 207kg, from Inglewood, QLD. These steers are and are travelling to Toowoomba, QLD. A line of 57 Bongongo blood Angus steers 6-7 months averaging 225kg from Braidwood, NSW, returned 327c and were purchased out of Hamilton, VIC. 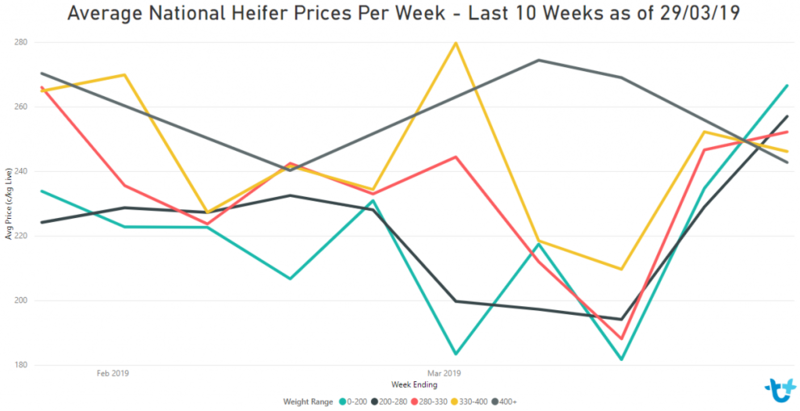 Demand of weaned heifers has surged, reflected in a price increase of 20c to average 261c and selling from 226c to 281c this week. From Armidale, 41 Santa heifers 5-6 months averaging 101kg returned the top price and will travel to Warwick, Qld. Yearling and grown steers averaged 286c this week, selling from 209c to 312c. Top price was achieved by a line of 64 composite backgrounder steers 10-14 months averaging 277kg, from Kingaroy, Qld. These steers are and will travel to Taroom, Qld. Yearling and grown heifers also posted a price increase to average 244c, selling from 196c to 270c. The top price was achieved by a line of 113 Angus heifers 12-15 months averaging 307kg, from Hannaford, QLD, travelling to Toowoomba, QLD. Joined females averaged $939 this week, down $83. From Inverell, NSW a line of 38 PTIC Angus cows 2-4 years averaging 463kg, joined to Angus bulls, returned the top price of $1330. These cows will travel to Greymare, QLD. Cow and calves averaged $1562, up $499 from last week, selling from $1090 to $2240. Top price was paid for a line of 17 cows 3-6 years averaging 692kg, with Angus-sired calves at foot 295kg, from Gawler, SA. This week saw the resurgence of the mid-week cattle sale, which saw three lots offered from the same vendor in Coonamble, NSW. All lots sold including a line of 61 NSM mixed-age 538kg Red Angus cows with 43 calves selling for $1150. The TAS Cattle Sale posted a 100pc clearance from the three lots offered from Montana, TAS. Highlights include two lines of Angus feeder steers 16-18 months averaging 240kg selling for 299c or $1420. These steers will travel to Smithton, TAS. Steers 350kg + sold from 289-299c/kg to average 295c. 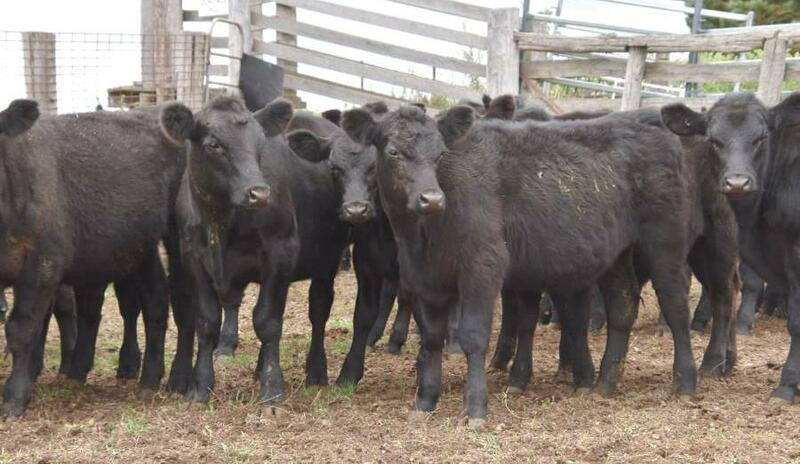 7-9 month old 211kg Angus heifers from ANGASTON, SA sold for 263c/$555.